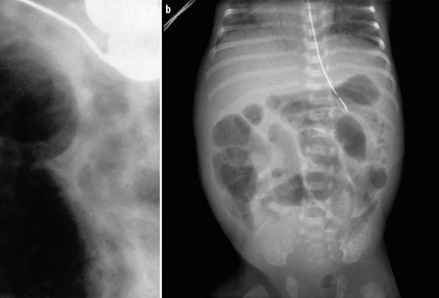 Intussusceptions may complicate the presence of a gas-trojejunostomy (GJ) tube  (Fig. 9). Most of the patients presenting with this complication are usually clinically stable and do not require urgent reduction of the intussusception. Most can be managed by replacing the tube with a standard or a shortened GJ tube or with a gas-trostomy tube. However, manipulation of the GJ tube and flushing with air or saline may also be helpful. Surgery is rarely required for reduction.